09:13:03: The process "/home/amsantosr/Applications/Qt/5.11.1/android_armv7/bin/qmake" exited with code 3. I don't want to use clang++. 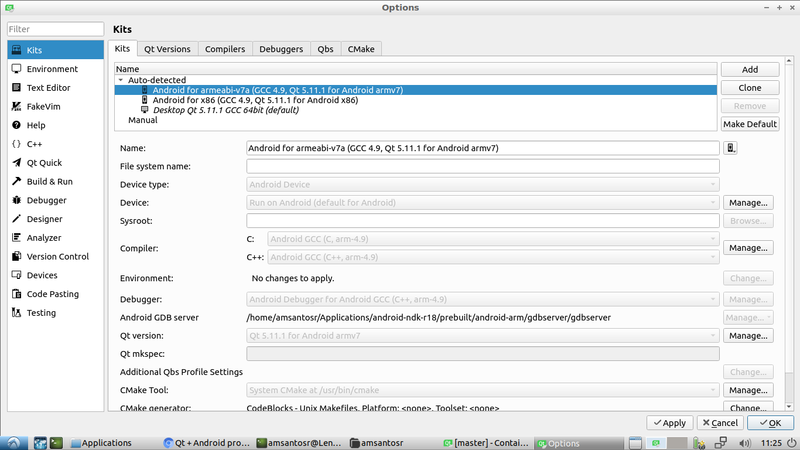 I am trying to use the default Qt and Android build configuration. How should I configure them correctly? @amsantosr I assume you're using Qt Creator. Could you please share the kits configured there? @amsantosr your kit seems Ok, and it was auto-detected by Qt Creator. However, you may have been bitten by the "using latest software packages" bug. It looks like GCC was ditched from Android NDK as of revision r18 (Sep/18). I haven't tried it myself yet, but I suspect that it might be using some symlink so calls to gcc still works using underlying clang. But for some special conditions (the ARM options here), it may not work. @Pablo-J.-Rogina Solved! I tried with android-ndk-r17c and it worked. Thank you! Relying on the deprecated gcc disables modern C++ usage like C++17, C++14 or parts of C++11. This is a no-go for current software development. So an specific bug has to be filed to work correctly with non deprecated compilers. So an specific bug has to be filed to work correctly with non deprecated compilers. I just run into this problem too. The bug report was already created in May but was unfortunately closed as invalid. @vlada What you might be ignoring is that the Android NDK releases are a real pain as its developers are changing things here and there breaking workflow if not compilation. It's for a reason that r10e has stayed the reference for so long. Most of the releases in between have broken stuff one way or another and that's outside of Qt. IIRC r17 is the first that can be used since r10e. @SGaist I know it is very difficult to keep up with all the changes Google is making to Android NDK. But sometimes it takes IMO too much time to fix the problems. I'm using the r17 and didn't run into any problems. Of course mith r18 Qt won't work at all because of the switch to Clang. I'm facing exactly the same problem, but I have problems also with r17c. Could you provide the complete configure options you have used? Project ERROR: Could not determine target architecture. See config.log for details. A similar problem was described here. I hope it might help you. However it works on my computer with Android-NDK R17, Qt 5.10 and 5.11, Java SDK 8 and latest Android SDK (API 28, Gradle 4.4, have some problems with 4.6). But the problem doesn't seem to be in the header file. The make process complains that target architecture was not defined. I would look towards this direction for the problem. Fehler beim Auswerten der Datei myProjekt.pro. in english: Error when evaluating the file myProjekt.pro. I think the problem is the clang error. But I have no idea where it comes from. When I compile the same code as a desktop app there is no error. You are likely using ndk18 which is not yet support (but almost) so currently as already suggested earlier in this thread use a prior version of it.